Philippine President Rodrigo Duterte has asked for a six-month extension for his war on drugs, saying there are too many people involved in the narcotics trade and he "cannot kill them all". Some 3,000 people have been killed since Duterte won May elections in a landslide on a vow to kill tens of thousands of criminals in an unprecedented blitz to rid the country of illegal drugs in six months. 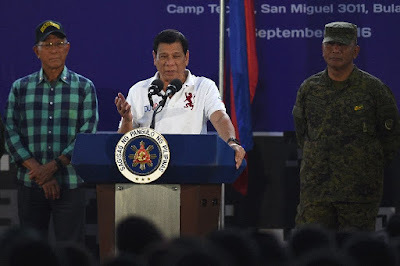 "I did not realise how severe and how serious the drug menace was in this republic until I became president," Duterte, 71, told reporters late Sunday in his southern home city of Davao. Launching his crackdown was like letting "a worm out of the can" he said, adding that he wanted "a little extension of maybe another six months" to try and finish the job. "Even if I wanted to I cannot kill them all because the last report would be this thick," he said, referring to a new police list of people including top officials suspected of being involved in the drugs trade. Police say they have killed 1,105 drug suspects in the slightly more than two months since Duterte took office. Another 2,035 have been murdered by unknown assailants, with human rights monitors saying these could be vigilantes, emboldened by Duterte's repeated calls for the public to help him kill criminals. The crackdown has drawn severe criticism from the United States, the European Union parliament and the United Nations over what they say are extrajudicial killings. Duterte has rejected the criticism, calling US President Barack Obama a "son of a whore" and UN Secretary-General Ban Ki-moon a "fool", and vowing to continue his campaign -- which is proving hugely popular domestically and boosting his poll ratings. Duterte promised on the campaign trial that 100,000 people would be killed during his crackdown and so many bodies would be dumped in Manila Bay that fish would grow fat from feeding on them. Days after his election win, Duterte also offered security officials bounties for the bodies of drug dealers, and has repeatedly pledged to protect police from prosecution over the killings. He argued that these robust measures are necessary to prevent the country becoming a "narco-state". Duterte was speaking at a news conference to announce the safe recovery of a Norwegian man, who had been held hostage for a year in the country's south by Islamic militants, who had beheaded two Canadian men captured at the same time.